For her appearance at a recent awards event, Shamita picked a Manish Malhotra gown to wear. With her hair in an updo, she rounded out the look with a pair of understated diamond earrings and a striking red lip. At an awards event held not too long ago, Shibani was photographed in Purple Paisley on the red carpet. Wearing her hair down, she rounded out the look with a pair of ivory sandals. We weren’t the biggest fans of the separates. The feathered bustier/crop-top really brought down the look; not one of Ms. Dandekar’s better sightings. 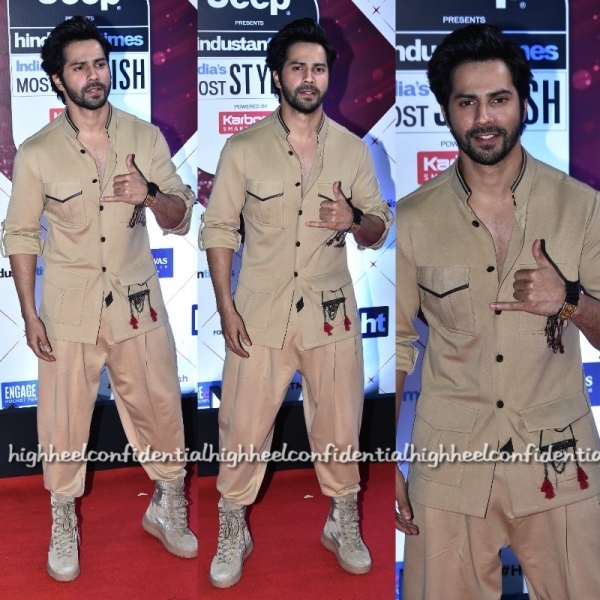 Varun Dhawan picked Shantanu Nikhil separates for the HT Most Stylish Awards. I felt that the look was too mono-chromatic. A different pair of shoes and maybe the look would have been better? Pairing her Anavila crop-top with a pair of metallic J Crew pants, Tisca attended a recent awards night. Earrings from Eurumme and feathered sandals from Miu Miu were her accessories for the evening. Though on paper it sounds like a fun look, am not quite buying it on Tisca. Do you feel differently?